Among the various different ethnic groups that live in the province are first and foremost Hui. The Hui（回族) make up about 1/3 third of the Population inside the Autonomous Region, where the Han (漢族) are the majority Ethnic Group. The Hui can be seen as the far descendants of various groups of Islamic descent who traveled along the ancient Silk Road to eventually settle within China. Among them Persian and Arabian traders of the Tang Dynasty Era (618 AD - 907 AD), Central-Asian soldiers allied with the invading Mongol Troops of the Mongolian Yuan Dynasty 1271 AD - 1368 AD) and others. 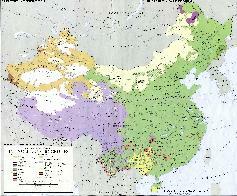 Thus, the Hui are a very mixed group of both Chinese and Persian/Arabian 'blood'. Although the Hui have adopted many features of the mainstream Han Culture their adherence to Islam influences their lives on almost all levels. They have their own dress-code, ethics, and follow Islamic dietary laws and reject the consumption of pork, the most common meat consumed in Chinese culture. They have produced a variation of Chinese cuisine known as the Chinese Islamic cuisine. Their mode of dress differs in that adult males wear white or black caps and females wear head scarves or (occasionally) veils. For the Complete explanation, read: "History of Islam in China", as well as our section on the Hui Ethnic Minority Group. After the Han and Hui Peoples, the third Ethnic Group within Ningxia are the Manchu（滿族), who however only make up 0.4 % of the Population. Naturally, the largest part of the total Manchu Population, some 46.2 per cent, live in their current official Homeland of Liaoning Province. The other Manchu's in China however are scattered around most living in Manchuria (Jilin Province and Heilongjiang Province), Hebei, Beijing City, Gansu Province, Shandong, Inner Mongolia AR, Xinjiang AR and also Ningxia Region. 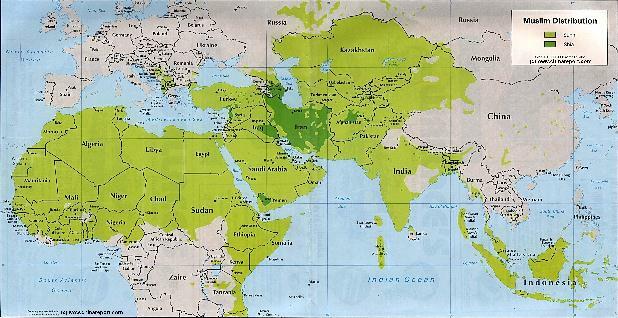 A Geographic Map depicting the Distribution of the Islamic Faith in China and Asia, as well as Europe and the majority of the continent of Africa. During the Cultural Revolution the Hui people, along with other religious groups in China, suffered unspeakable persecution. After Mao’s death in 1976 AD and the end of the Cultural Revolution, the Chinese government changed its political strategy and its policies. Among things the guaranteed autonomy of the Hui people within their Autonomous Region was reinforced and a Government sponsored program was begun to restore its many mosques. Under the new policies, religions are recognized but are officially controlled by the government. By May 1984, only a few years into the new policy and program, already some 1400 mosques had been restored in Ningxia. Although since the central government has given permission for Islamic literature to be published and sold throughout China and especially in Islamic Regions, recent Ethnic Tensions in Western China (P.R.C.) have renewed scrutiny of Islamic Publishings. Due to historic influences derived from the Silk Road and history the predominant religions in Ningxia AR are Islam and Buddhism. The Hui are the main proponents of Islam, whereas both Mongols and Tibetans adhere to their own variation of Buddhism (Lamaism). the Corban Festival, or Eid Al-adha; Lesser Bairam (Kaizhai Festival) and Shengji Festival. In addition Ramadan (fasting month) is practised by many in Ningxia. Ramadan. During the entire ninth month of to the Hui calendar, men older than 12 and women older than 9 will fast, which means they cannot eat anything from sunrise to sunset. Lesser Bairam is celebrated on the first day of the tenth month and lasts three days. Relatives and friends are served choice beef and mutton, and fired cakes which are their favorite food. Corban Festival is on the tenth day of the last month. The morning of the festival, festival participants fast in the morning. After attending the mosque, they kill oxen and then share them with the poor families and relatives. Selling of the oxen is not permitted on this day. A fourth 'Festival' among Hui people of Ningxia involves the tradition of Hua'er. Hua'Er is a form of folklore rather than religion, especially prevalent in Ningxia, Gansu and Qinghai Province. During festivals and the sixth month of the year, there is a pageant and people sing joyfully for six days. have ended up there in various ways. Many of the Manchus that live outside the Manchu homeland are descendants of Manchu administrators and military colonists. Due to the fact that intermarriage between Manchu & Han (or others) were forbidden by Imperial Law until the very last years of the Manchu-based Qing Dynasty (1644 AD - 1911 AD) members of the Manchu Clan in remote regions such as Ningxia have often retained much of their Manchu heritage and culture. Modern Times have cahnged these things though. Members of yet another 28 ethnic groups can be found in Ningxia Region, albeit in even smaller numbers making up but 0.1% of the Population. Among these are the Tibetans, the Mongols and the unique (Western) Chaoxian (Korean). As one of China's recognized minorities, the Hui traditionally enjoyed special privileges such as government food subsidies and exemption from the one-child policy. As a result the population of Ningxia Hui Autonomous Region has exploded, rising from under 2 million in 1949 AD to over 6 Million in 2008. New Policy changes have brought the Hui under stricter population control, stabilizing the population of the Region in the last few years. Minority members still speak Tibetan and Mongolian.